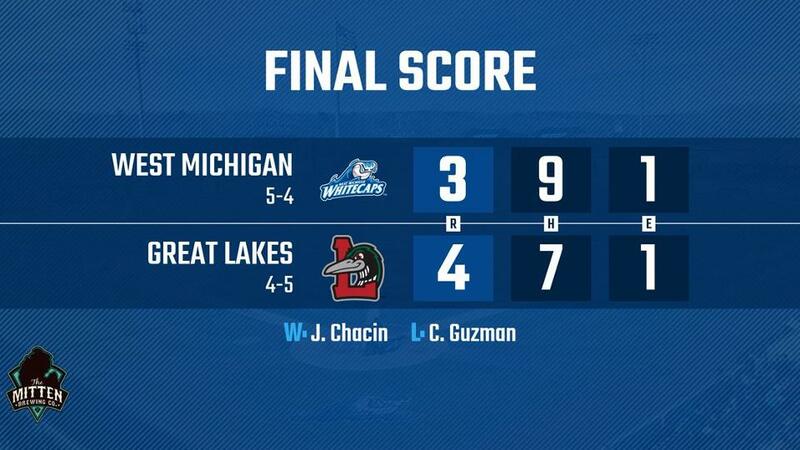 COMSTOCK PARK, MI - The West Michigan Whitecaps enjoyed an early lead, but a pair of timely home runs by the Great Lakes Loons spelled the difference in a 4-3 loss in the opening game of a three-game series Friday evening at Fifth Third Ballpark. Both Great Lakes home runs were hit in the direction of wind gusts that reached 25 mph and resulted in three of their four runs tallied on the night. The Whitecaps touched up Loons starter Guillermo Zuniga early as right fielder Avery Tuck scored Ulrich Bojarski on a run-scoring single in the second inning. Two batters later, Wenceel Perez laced an RBI-double to right field plating Tuck and giving the Whitecaps a 2-0 lead. Loons second baseman Jacob Amaya evened the score with an opposite field two-run home run in the third inning. The Loons produced single runs in both the fourth and fifth off 'Caps starter Carlos Guzman and extended their lead to 4-2. With two outs in the seventh, 'Caps reliever Maddux Conger attempted to squirm out of a seventh-inning jam but had to exit the game with an unspecified injury. Angel Reyes came on and provided a key strikeout to squash the Loons threat. Reyes provided sterling relief in his 2.1 innings and kept the game close while striking out four. In the Whitecaps eighth, Parker Meadows fired up the Fifth Third Ballpark crowd on a cool night by launching an inside-the-park home run to deep right-center field - his first homer with West Michigan. The Meadows marvel closed the gap to 4-3, but the 'Caps were retired in order in the ninth as Great Lakes took the first game of the three-game series. Loons reliever Jose Chacin (2-0) tossed 4.1 innings, allowing only one run on four hits and five strikeouts in his second win. Carlos Guzman (1-1) took the loss for the Whitecaps, pitching five innings and surrendering four runs and five hits while striking out three. The Whitecaps fall to 5-4 on the season, while the Loons improved to 4-5. Both Bojarski and Nick Ames extend their respective hitting streaks to six games, and Perez enjoyed his first multi-hit game of 2019 with a double and a single as West Michigan outhit Great Lakes nine to seven. Despite the loss which snapped a three-game win streak, West Michigan has won five of their last seven games. The Whitecaps three-game series against the Great Lakes Loons continues Saturday from Fifth Third Ballpark at 4:00 pm. Pitcher Gio Arriera makes his second appearance of 2019 against Loons pitcher Jeronimo Castro. Broadcast coverage with Dan Hasty and Mike Coleman starts on the Whitecaps Baseball Network at 3:50 pm. Tickets are available for any Whitecaps 2019 home contest by calling the Whitecaps front office at 616-784-4131 or by visiting www.whitecapsbaseball.com.